Powers: He could touch any non-organic material and turn into that material. He can also switch immediately from one material to the next. For a short time, Everett could attract metal with his left hand and repel with his right. Will Everett was a multi-medal winner in the 1936 Berlin Olympics . Despite this accomplishment the young African -American was a constant target of racism unable to get work took a job as a janitor for Dr.Terry Curtis . Soon after Will Everett is kidnap by the Ultra-Humanite and was subjected to power barrage from a machine created by Dr. Curtis,he soon gain superpowers from it . As was blackmail to work for the Ultra-Humanite but Will turned on the Humanite and joined the All-Star Squadron to fight the Axis powers during WWII . In February 1942, Everett and the Squadron help defeat Ultra-Humanite in his hometown of Detroit. 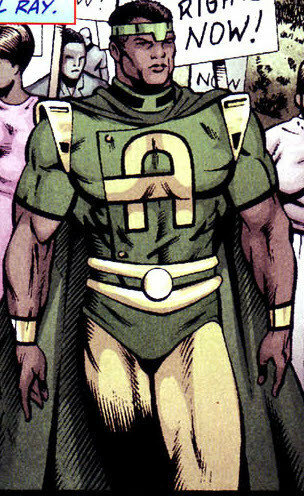 During the first Crisis, Amazing-Man was one of a group of heroes chosen by the Monitor to stop the Anti-Monitor’s quest for destruction. In the 1950s, his secret identity was revealed by J. Edgar Hoover to the public. This endangered Everett’s wife and family’s lives. During the Civil Rights Movement of the 1960s, the death of his nephew along with two other civil rights activists spurred his involvement in the Civil Rights Movement. He led marches against segregation across the United States of America, and suppressed riots in Detroit. Everett was also responsible for the capture of Martin Luther King’s murderer James Earl Ray. He was the third most important person in the fight for civil rights, the other two being Martin Luther King and Malcolm X. Will Everett Senior later retired and had a family. When his son died he took care of his grandson Will Everette III who he told all about his adventures. As an old man he was last seen in the hospital, visited by his grandson Will Everett III. The senior Everett was dying of cancer theorized to be linked to his powers.